Adelaide Botanic Park, Sat 11 Mar. For the last couple of last years, for some ridiculous security reason, people entering WOMADelaide have not been able to take in bottles of water. Empty bottles though were acceptable so there were scenes of people pouring out their water at the entrance. Thankfully sanity has prevailed and this year bottles of water are allowed! WOMADelaide is not just about music. In the last few years it has broadened its scope to include talks and things like cooking demonstrations from visiting artists – Taste the World. I began day 2 with a visit to the Speakers Corner tent to listen to Aziza Brahim talk about the plight of the Saharawi people of the Western Sahara. She, typical of many of her generation, had spent her entire life in a refugee camp before moving to Barcelona as an adult. She now uses her music to advertise and lobby for the plight of her people who are still stateless and marooned in refugee camps in Morocco. But back to the music. The Ainu, an indigenous people from the island of Hokkaido in Japan, have long been treated as second class citizens. The Oki Dub Ainu Band exists to play their brand of Japanese music, and highlight the condition of the Ainu people. They performed in traditional costume, and featured traditional stringed and mouth instruments. The mouth instruments resembled the sound of the Jews harp. They settled into a pleasing pattern of grooves that was nicely rhythmic and managed to retain an indigenous essence. It was quite hypnotic but it still sounded Japanese and the traditional flavour of their music did not get lost in the mix. 9 Bach, a folk group from Wales drew a large crowd. Lovely female harmonies were on show – backed by a sold driving beat. Plucked dulcimer added intrigue to the sound and though Welsh they may be the vocals had that inimitable stamp of much traditional folk music from the UK. 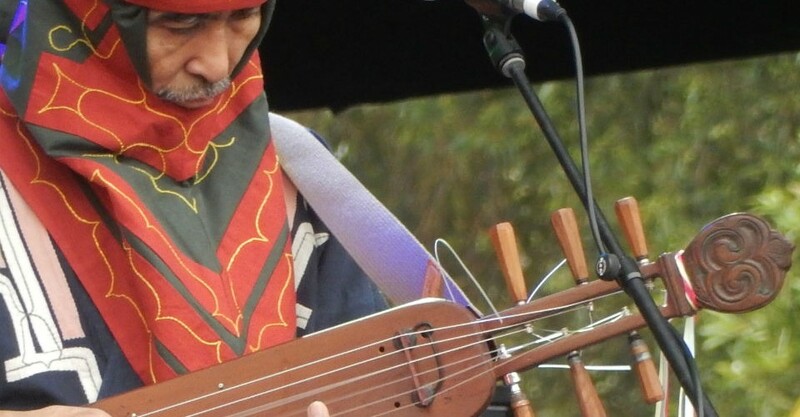 I had been wondering for years, given our historical connection with Vietnam, when Vietnamese music would turn up at WOMADelaide and it finally happened this year. Hanoi Masters consists of two older men who have obviously been playing traditional Vietnamese music for decades, and a younger woman who now lives in America. The super traditional music of the old masters is an acquired taste – quiet and mournful – and felt like a throwback to the early day of WOMADelaide when traditional sounds were presented unadorned. But it felt like the Hanoi Masters were really just an excuse for the female member of the troupe to demonstrate her prowess on a range of traditional instruments, and she was wonderful. She shared useful information about the instruments she was playing and the role of Vietnamese music in dealing with the horrors of war. This explained the plaintive and mournful air of the pieces they played. Brushy One String hails from Jamaica, and yes, he plays a guitar with just one string. Brushy had a Jamaican flag hanging off his guitar neck and is an engaging character; quite chatty and full of personality. The one string essentially acts as a bass part to his vocals. It was all quite listenable, and he eventually, as all good Jamaicans do, got to reggae. But I found myself wondering if he was just an eccentric white guy living here in Adelaide whether he’d get a gig at WOMADelaide. I doubt he would. Most people will remember Toni Childs as the singer of Stop Your Fussing – a mega hit from the ‘80s. It’s amazing what just one hit can do for your popularity. She drew a huge crowd to the Novatech stage and she didn’t disappoint. She began by saying she wanted to cleanse our musical palates from everything else we had heard in the preceding day and a half, and she did this with an atmospheric piece featuring bagpipes and drums. What followed was a solid set of pop songs of quality and substance, and that unmistakable and tuneful vocal style – lovely to listen to. Aurelio is from Honduras, and was introduced as a musician who straddles influences from the Latin world, Africa, and the Caribbean. And it was a fair description. Though four of the six musicians on stage were either percussion or bass, they didn’t lose a sense of melody as they played a set of songs that contained a lot of variety – reflective of the multiple influences that inform their music. Strangely one song sounded uncannily like the music from Paul Simon’s Graceland album. There was some lovely interplay between Aurelio and his electric guitarist, and they left enough space in their music for some beautiful lead guitar solo work that didn’t rely on over-speed and volume. Really quite tasteful. Baba Zula were a weird mob. Billed as the torchbearers of Turkish psychedelic rock and roll, their two frontmen appeared in kind of traditional dress but it was more about not taking things too seriously I suspect. They rocked the Zoo stage for an hour with good solid rhythms that kept a connection with their Turkish roots. Traditional strings (oud, saz) were electrified. In fact, there was a lot of electronic gadgetry onstage but they still managed to keep things from spiralling out to anonymous global funk land. Quite impressive actually – and a good model for other world music bands to follow I’d suggest. And then of course there were The Waifs. A huge crowd packed the area in front of the Foundation Stage and they played their polished brand of folk rock to an adoring crowd. If you are way down the back of the main stage this year you can watch the concert on a big screen that has been erected about two thirds down the way toward the back. A separate crowd gathered there for the not quite live version of the show! Two days down and this 25th Anniversary WOMADelaide already feels like a huge success. WOMADelaide management however may be a little concerned about crowd numbers. Great for those in attendance – it’s much more comfortable when it’s less crowded – but it does feel like numbers are down on last year. And rain is predicted for day 3.